Digital technology is disrupting traditional operations and the effect on supply chain management and warehousing has been significant. 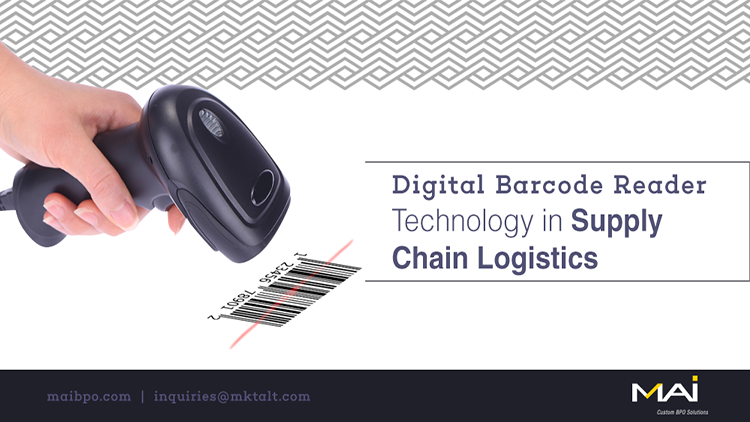 Legacy systems such as laser-based scanner technologies are steadily giving way to digital barcode readers which have the capability to capture and decode the barcodes printed on the product into both readable text on the device’s display as well as a data format for the computer to process. A typical digital barcode reader consists of a scanner, the decoding/display system and a cable, however, digital scanners can range from simple array imagers and laser scanners to complex high-speed image-based barcode readers. Upgrading to such next-generation barcode scanners delivers multiple advantages. It increases read rates, enhances productivity, improves accuracy and real-time visibility and, ultimately, reduces cost. Though the job of processing inventory can be done using legacy laser scanners, there are many limitations. Such scanners capture only a single scan line at a time, limiting their ability to “read” information. Moreover, these scanners have several moving parts that are susceptible to break down and require frequent maintenance. Newer digital barcode readers use imaging technology, similar to the technology found in digital cameras and microprocessors. This increases read rates and offers the capability to read even poorly printed or damaged codes. On the hardware front, these devices do not contain moving parts. Hence they tend to last longer without breakdown and require minimal maintenance. Warehouses, transportation providers, retailers, and other stakeholders in the supply chain network scan barcodes as packages enter and exit their facilities. Increasing read rates speeds up such inventory processing, improving productivity. Sophisticated barcode scanners have the capability to read package information from hundreds of coded packages and parcels that move through the conveyor belts. The difference in speed can make a big difference for large warehouses and shipping companies in terms of improved productivity, accuracy and efficiency. The latest digital scanners reduces no-reads. This means fewer parcels are diverted to manual processing, freeing up the valuable man-hours involved in re-routing and re-labeling tasks and speeding up the movement of inventory. In today’s highly competitive business environment, such improvements in efficiency can make the crucial difference between retaining customers or losing them. Managers can identify and resolve trouble-points or bottlenecks in real time. Customers can track their shipments which reduces calls to customer support team while increasing customer satisfaction levels. Storefronts can schedule and track inventory replenishments effectively, leading to improved sales. Storing images and data for later retrieval and analysis adds to the big data of the organization which may be put to many uses, from better predictive analysis to determining the root cause for delays in the supply chain. Barcode scanners carried a high price tag in the past, but with improved technology, devices are not only advanced, but also compact and more affordable. In fact, with barcode fonts freely downloadable from the internet, and free availability of smartphone apps to scan and interpret such barcodes, small organizations can set up a basic barcode system on the fly, without any investment. Nevertheless, investment in digital barcode scanners makes for excellent investment and delivers a high ROI. The investment returns back in the form of greater savings from productivity, in a short period of time. Modern barcode scanners come either as fixed mount or mobile variants. Either way, these are compact, yet powerful devices, with a sleek design, good user interface, and in-built flexibility. The investment to upgrade to these machines pays back for itself many times over and is a win-win proposition for all stakeholders.